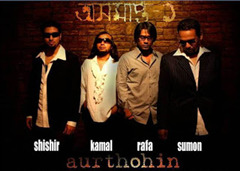 Aurthohin is a Bangladeshi hard rock and metal band formed in 1998 by bassist, singer and songwriter Sumon. He is the only founding member still with the band. Aurthohin are known for their mix of melodic acoustic numbers and extremely heavy metal numbers in their albums often containing lots of bass slaps, taps and solos. They have released six albums. In 2008 they released their album Aushomapto 1 and its sequel in 2011 Aushomapto 2. Their current lineup is Sumon on vocals and bass, Rafa on vocals and drums, and Shishir on guitar and keyboard. In 2014, after Ibrahim Ahmed Kamal Ahmed left the band,Kazi Faysal Ahmed from Metal Maze has been playing with Aurthohin as well as a guest guitar player. The idea of a band, and the name of the band, Aurthohin, came from Sumon's solo project, Sumon O Aurthohin. 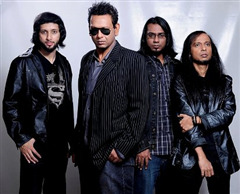 The album, released while Sumon was still a member of Bangladeshi metal pioneers Warfaze, featured vocals and bass work by Sumon and a slew of guest artists and musicians. One particular track, the titular "Aurthohin", featured eight of the most prominent guitarists of the era playing a collection of 27 solos, while the vocals were performed by the then-vocalist of Warfaze, Sunjoy. The name of the band came from that track, leading into his first album as a band Trimatrik ("Three-Dimensional", in Bengali). The album featured a confusing line-up of musicians, since Sumon credited both musicians that had left the band and had joined after the album was recorded. According to the sleeve of the album, though, the line-up consisted of Sumon as vocalist and bassist, Piklu as lead guitarist, Russell on the rhythm guitars and other vocal duties and Rumi as the drummer. Trimatrik also started a trend of songs that would see "sequels" in later albums, including the ballad "Odbhut Shei Chheleti" and the taunt anthem "Guti". The album also featured a few acoustic based soft rock numbers with heart melting lyrics such as "Amaar na bola kotha". Shortly after Aurthohin's 4th album 'Dhrubok' got released Sumon's health deteriorated. Due to Sumon's illness the band stopped almost all the gigs. At the end of 2004 longtime guitarist Piklu left the band. Sumon got the affiliation from MTD (Michael Tobias Design). In 2005 Sumon's jaw got dislocated.Doctors told him to give up singing permanently. Chances of recovery were very low. Aurthohin stopped all their activities, Sumon and the others were planning to disband. But suddenly things began to change as Sumon was getting well. Aurthohin performed with the same line up until 2006. Kamal of Warfaze joined as a guest guitarist. After doing a few gigs Sumon offered him a permanent place which he accepted. Soon after the band started working on their fifth album. Due to illness of Sumon, Aurthohin didn't play many concert's in 2012. After a long break they came back with live gigs in early 2013. In the middle of the 2013, Aurthohin announced on their Facebook page that Kamal is no more with the band. On 15th October 2013, they released their new single "Amjonota", that has lyrics about Bangladesh's current events, corruptions, political conflict and other issues. Aurthohin along with Rockstrata, Warfaze, Artcell, Cryptic Fate, Stentorian, Metal Maze, Black, Nemesis, Vibe, Kronic and The Attempted Band are among the first and few bands in Bangladesh to popularize rock and heavy metal in the country. Their popularity paved the way for many bands to be formed especially in Dhaka. Why Book Aurthohin Through ArtiseBooking?